1. 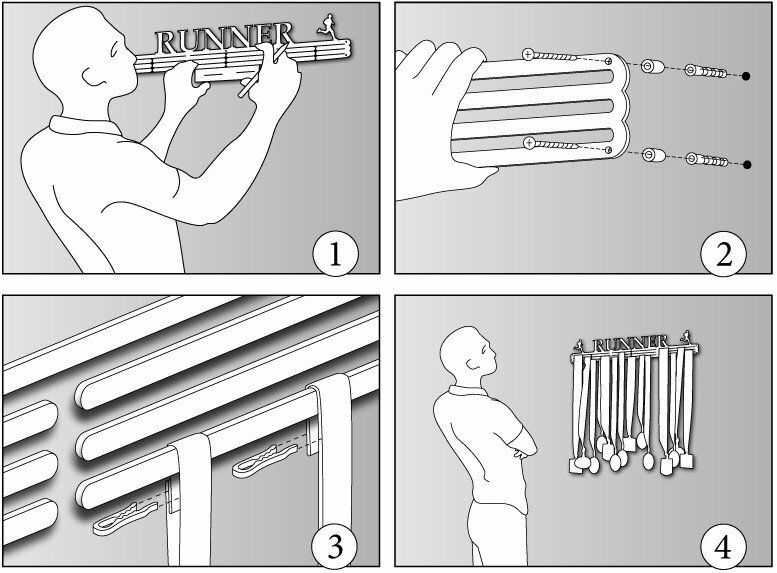 Once you've picked a spot for your medal display, hold it against the wall and use a level to make sure it's straight. Mark the wall through the mounting holes with a pencil. 2. Drill holes where you've marked the wall with a 3/16" drill bit and insert the drywall anchors. Use a screw driver to drive screws through the medal display, through the spacers, and into the anchors as shown. 3. We include ribbon clips with your order if your display has multiple rows of hang bars. To achieve a staggered look, simply adjust the hanging length of some of your medals by overlapping the ribbon and using the clips to cinch it in place as shown. 4. Hang your medals, stand back, and enjoy.